Fitting the Praxis-built bottom bracket was easy thanks to DMR’s thoughtful inclusion of a proprietary tool that fits a standard 3/8in drive. The SRAM-style direct-mount chainring only requires three bolts nipping up so, all-in-all, it’s a doddle. To make sure it goes without a hitch, a Praxis spec sheet shows how many spacers you need to run with your BB shell width — then it’s just a matter of slotting the two-piece unit together and torquing up the single crank bolt. After three months of use, the performance of the Axe hasn’t blunted. The stiffness of both the arms, and the beefier spindle, is palpable. Pumping through turns feels more direct, climbing seems more efficient, and landing drop-offs and jumps more assured. Overall, it’s made a big difference to the solidity of our test bike. The narrow/wide Blade chainring needed a little bedding in to the new chain before they would engage together fully, but since then I’ve only unshipped the chain once. The Praxis BB, however, has been less impressive. After only a handful of wet rides the bearings started to grumble. While barely noticeable on the bike — thanks to the perfect tolerances between the crankset spindle and inner bearing races — upon dismantling them for inspection, it’s clear that their survival through a typical British winter seems unlikely. 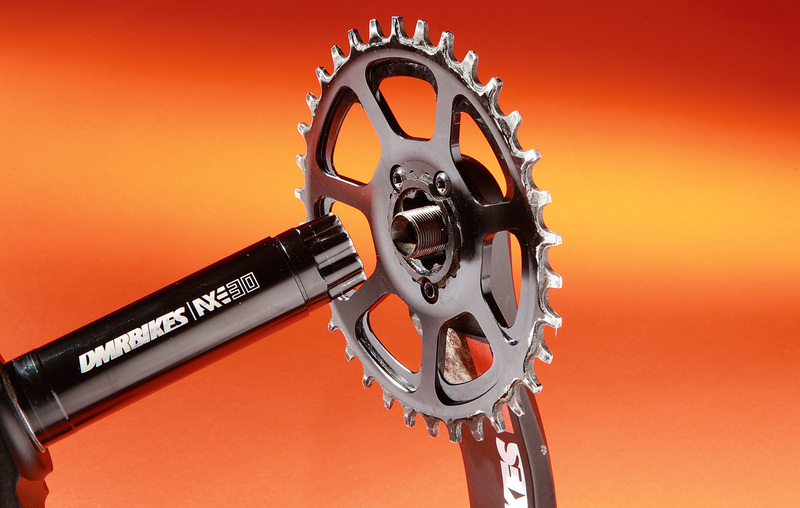 Overall the DMR Axe offers excellent value; which is almost half the price of Shimano XTR.